It said staff were working for the inspectorate Estyn and the regional education body to bring in extra income, adding that "the point where health and safety could be compromised" has been reached. 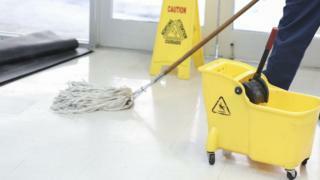 "We are looking at redundancies and we have head teachers cleaning halls and toilets on the weekend for lettings to make money," the letter said. "Your children's education and life chances are being compromised by the Welsh Government's failure to fund schools properly. "We are expected to enable a new curriculum for Wales, a new additional learning needs bill and produce one million Welsh speakers. None of these can happen at the current funding levels." The cluster consists of 16 schools in and around Penarth, including two comprehensives, and a special school. Vale of Glamorgan council has previously complained it does not receive enough from the Welsh Government for education. A Welsh Government spokesman said: "We recognise that to continue to raise standards, our schools and teachers need additional support. "That is why we recently announced the single biggest investment for teachers since devolution - a £24m package of professional learning to support the new curriculum, giving schools the time and resources they need. "It is important to note that Welsh Government has presented local authorities, including Vale of Glamorgan, with proposals to update the 1991 census-related element of the current funding formula, however this proposal was not pursued."